Before there were scanners, before there were Xerox copiers, ditto machines, mimeograph machines, thermofax machines, even before there were those trick and most modern “correctable” typewriters, which would allow you to correct your last 25 or 30 letters, and that’s all, there was the “jelly hectagraph”. I have been thinking about the jelly hectagraph my Mother used to use, because for years she would drag it out at Christmas. The way the jelly hectagraph worked, to make copies, approximately, was like this: first, you would cook some ingredients, that came in a kit, and then pour the thick hot liquid into a very shallow 9 x 12 metal pan to cool. After it was cool, it was quite firm, but still jelly like. My Mother, Lorraine, would instruct us kids to not touch it, to be sure it was pristine for the copy job ahead. I believe she may have had a special ribbon on her typewriter, or one could use a special pencil, to then type or write the message one wished to make copies of. Then, you would lay your message paper onto the jel, carefully, and wait a couple of minutes for the ink to stick to the jel, and then peel the original off of the jel. And lastly, you would also very carefully lay your new paper onto the jel, and you could make 10 or so copies before the ink on the copies would become too faint. If you needed more copies, the process would begin again. It was a big hassle. But when my wife Marie and I met, and I said something about a hectagraph, and she knew exactly what I was talking about, and had used one herself as a child, well, I knew she was the one. The reason my mother needed copies, was that she was the willing and continually elected secretary of The Harrison Street Homeowners Assn., where we lived at the foot of Mt. Tabor in southeast Portland, Oregon. At Christmas time, Harrison Street had for many years dressed up for the holidays, becoming the city wide attraction known as “Christmas Lane”. Mom’s flyers, which I think she called “The Harrison Street Gazette”, was filled with news of the current year’s Christmas lighting schedule, and other pertinent information, like the time and place of the annual Harrison Streeters Christmas Dinner, usually held at Portland’s popular steak house, “The Old Country Kitchen”, where, if you can put the 72 oz. steak away in an hour, and all the trimmings, it’s free! Lloyd Hornbeck would drink too much, and his next door neighbor, whom he called “Parksy”, would be right behind him, there at the steak house, as Moms and Dads discussed the coming weeks on Christmas Lane, and how they would be decorating their houses that year. 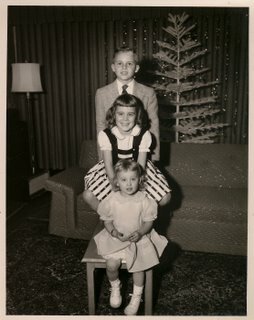 My Mom, bless her soul, always had some wacky idea, and my sisters and I love to recall the white plastic tree Mom favoured, which she would place smack in our living room window, which faced the street, and swath it in early and stiffish turquoise mesh netting, also known as tulle, so it looked like a really fake tree with stiff turquoise mesh netting clinging to it in a sort of haphazard way. But the Boyces lived next door, and since their daughter Charlene had announced to my Mom that “our house is always best”, Mom would try, on a budget, to outdo the Boyces, whose black lit giant white flocked pine tree was all the rage on Christmas Lane. One year, in addition to our funky tree, Mom decorated the large dining room window like a Christmas present, complete with shiny red wrapping and bow, and the Swedish version of “Merry Christmas” written across it on the green ribbon, diagonally, which read “God Jul”. One evening, maybe Christmas Eve, as my Mother and I stood outside before Mom’s Lovely Christmas Creation, admiring it, as hundreds of cars and pedestrians streamed by, Mom and I were caught unawares by a man whose only sly comment to his wife, as they passed, not knowing we lived there, was, “What in the hell does “God Jul” mean?” To my Mom’s credit, she thought it was hilarious, and that sentence is indelibly etched into our family lore. Living on Christmas Lane was great fun for a kid, being the center of attention, and my friends at school were obviously jealous. At the end of the street, in the cul de sac, the Harrison Street Dads would construct a creche every year, and place in it the Plywood Baby Jesus, The Wise Men, and the camel and other animals, which were painted by Mrs. Conway, our street artist. As I grew older, I was allowed to show up for the construction of the creche, and I would get the job of collecting downed fir branches from the slopes of Mt. Tabor, which would then be stapled to the sides of the creche. The year I turned 12, I got to do some of the framing, standing alongside the cigar puffing Parksy, and other Dads.